Just what makes anything the best? Finding the best degreaser will ultimately be the winning combination of benefits; but only you can decide what that winning combination is going to look like. Can the product produce the results. Is the product cost effective. Is the user experience acceptable. Is the product safe for all parties involved. Everything I do in my profesional world of auto detailing will be about delivering superior results with the least amount of effort, in the least amount of time; a true win/win for both sides. Best Degreaser: Engines, upholstery, etc. Since this product from Meguiar's is labeled as a super-degreaser, it would be natural to limit this product to engine degreasing only. But the fact is I use this product as an all purpose degreaser and cleaner. If my APC (all-purpose-cleaner) from Meguiar's is insufficient for the cleaning job on hand, I will be reaching for this next level of strength with this degreaser detergent product. In my opinion this product would be more appropriately labeled as an all purpose degreaser due to the fact that it is safe for so many other cleaning tasks associated with detailing. Aside from using it as my best engine degreaser, I use it when detailing most car interiors at some point. Is not caustic like many of the "hot" degreasers you can get professionally. Doesn't leave a white residue like other degreasers. If you are either a Meguiar's fan boy or you like the appearance of looking more professional in your own mind; then go with this. Despite what the labeling implies, I use this product both as an all purpose degreaser and cleaner. Since it is a concentrate, I simply dilute it down to my desired strength and use it on both interior, exterior, and as a car engine degreaser. This is the dilution I use whether I am using it as an engine degreaser, or as an interior all purpose degreaser. 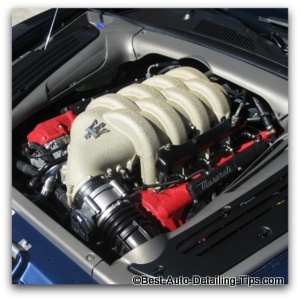 Engine Degreasing: While I do use this product to clean and detail engines, this page is not specific to the actual techniques of cleaning and degreasing your car engine, you can see car engine cleaning for that. Meguiar's Super-Degreaser which is the purpose of this page. If you want to see what I use and recommend now based on you and your specific world, you can see my car upholstery cleaning page. Forget about bulky carpet extractors, forget about high-pressure water, forget about many of the traditional methods of carpet shampooing and cleaning that you have been lead to believe. Always read manufacturers label instructions. This is always the place to start before you venture into the waters of off-label uses. Always test product on material in an inconspicuous place; always, always! This is a professional grade product and is not "idiot proof". The best degreaser based on the combination of winning benefits. Water based, biodegradable with no ammonia, bleach, or petroleum solvents. Perhaps the only NSF certified (you can read what this means at Wikipedia)all-purpose cleaner and degreaser. More than half the cost of the Meguiar's best degreaser. Yet another cleaner/degreaser that could easily be named best degreaser by many. Also far less expensive than the Meguiar's super degreaser I use for years exclusively. An iconic brand that develops great products. The actual sprayers I use professionally. The most ergonomically friendly sprayers I have found. The sprayers you will see in many of my videos. There are not a shortage of sprayers you can pick and choose from. With that said, I use these exact sprayers professionally and find them the most user friendly. With that said, you will never find a sprayer that lasts forever regardless of what claims are made. But for the money, I have chosen these year after year in my professional world and continue to use them to this day. I also use and recommend using a pump garden sprayer when using any product you have decided is the best degreaser for you. It will save your hand with repeated pumps from a traditional hand-held sprayer for any of those big jobs like degreasing an engine. I hope these reviews have helped and I wish you happy cleaning!